Body integrity identity disorder (BIID), formerly also known as apotemnophilia, is characterized by a desire for amputation of a healthy limb and is claimed to straddle or to even blur the boundary between psychiatry and neurology. The neurological line of approach, however, is a recent one, and is accompanied or preceded by psychodynamical, behavioural, philosophical, and psychiatric approaches and hypotheses. Next to its confusing history in which the disorder itself has no fixed identity and could not be classified under a specific discipline, its sexual component has been an issue of unclarity and controversy, and its assessment a criterion for distinguishing BIID from apotemnophilia, a paraphilia. 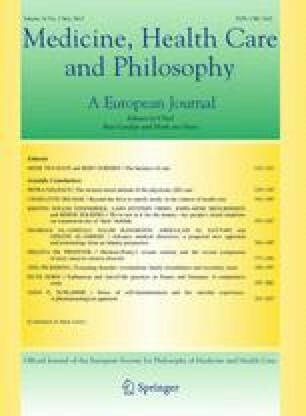 Scholars referring to the lived body—a phenomenon primarily discussed in the phenomenological tradition in philosophy—seem willing to exclude the sexual component as inessential, whereas other authors notice important similarities with gender identity disorder or transsexualism, and thus precisely focus attention on the sexual component. This contribution outlines the history of BIID highlighting the vicissitudes of its sexual component, and questions the justification for distinguishing BIID from apotemnophilia and thus for omitting the sexual component as essential. Second, we explain a hardly discussed concept from Maurice Merleau-Ponty’s Phenomenology of Perception (1945a), the sexual schema, and investigate how the sexual schema could function in interaction with the body image in an interpretation of BIID which starts from the lived body while giving the sexual component its due. This research was supported by a research grant of University College Ghent.